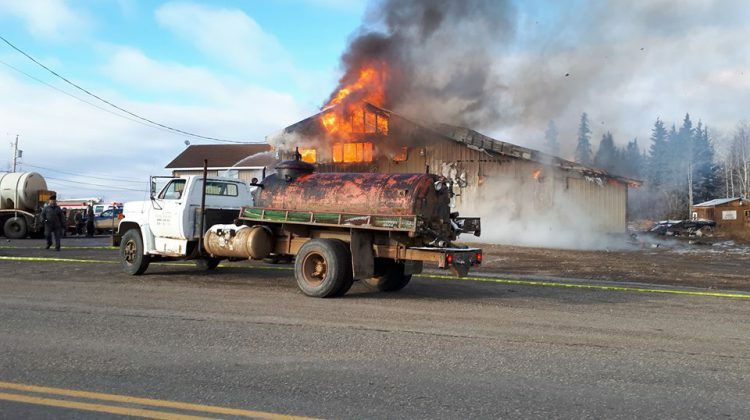 Two GoFundMe pages have been set up for the family who owns the Grassy Plains Store in Burns Lake and the family who lived in the apartment above the store. Witnesses reported seeing the fire break out before 9AM yesterday, but the cause is still unknown. Kim Saffel and her two children were in their apartment when the fire broke out in the building bellow but managed to get out safely. The Grassy Plains store is owned by the Marten family, who during the wildfire season stayed behind during the evacuation, offering food, water, and support to community members and firefighters fighting the fire. “They were the ones that were instrumental this summer with the evacuation orders, keeping everyone fed, everyone stocked up. They were the ones that did everything on that side,” sister of Kim Saffel, Kathy Willson. There is a GoFundMe page to help the Martens whose business was completely lost after the fire broke out, burning it to the ground. Saffel, who rented out the apartment upstairs, also worked downstairs at the Grassy Plains Store. “They escaped with nothing but the shoes on their feet, they did not even have jackets,” said Willson. A second GoFundMe page has been set up to help Saffel and her children. “The money is to help her stay afloat because she also works at the store, so she has not only lost her home and all of her possessions, she has also lost her job,” said Willson. Donations of clothing and coats for Saffel and her daughter and her son can be given to her family in Burns Lake or at the Moose Radio Station in Smithers. Saffel and her 16-year-old daughter are both size medium, and her 15-year-old son is a pant size 32 and shirt size large. In addition to clothing, the family also needs things for a kitchen, bedding, toiletry items, school supplies, and entertainment items for the two teenagers.